Past Rotary International President Bill Boyd addressing 2012 World Water Summit participants. All of us who have an interest in water, sanitation and hygiene realize that the needs of much of the world can only be addressed by targeted and well thought out projects and programs. History tells us that an unacceptable percentage of well-intentioned activities fail and this is simply not good enough. There are limited resources and they need to be used effectively. That’s why Rotary and Wasrag are pleased to host a three part webinar series to share knowledge and strategies for conducting more effective WASH projects. Better knowledge leads to better projects and none of us know it all. Every opportunity to share our experiences with others opens us the chance for us to learn as well. The webinar series will share lessons learned at the May 2014 World Water Summit in Sydney, Australia, which focused on the topic of collaboration with governments, NGOs and the private sector. The summit provided excellent information, opened up new conversations, and gave participants the opportunity to exchange ideas through workshops. 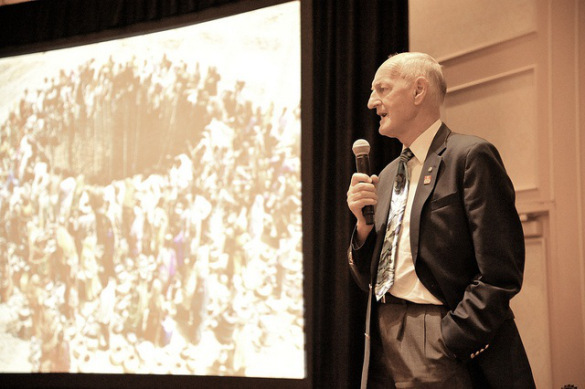 If you weren’t able to attend the summit in person, these webinars are a great opportunity for you to interact with WASH industry experts and experienced Rotary project leaders. I urge you to participate in the webinars not just for what you can learn but also for what you can contribute. Register to attend the World Water e-Summit series using the links below (you must register separately for each webinar in the series). Registration is free! Where is the location for this series? Hi Claire, this series will be hosted online and you will be able to participate from your computer. Once you register for the webinar(s) using the links above, you will receive a confirmation email with a link to access the webinar at the scheduled day and time. Feel free to email us at rotary.service@rotary.org with any questions.